The doors of City Hall were opened on Thursday evening to a young woman who recently returned from the Special Olympics World Games in Abu Dhabi with a bronze medal. Lucy Dollard (25) won the medal in the javelin event on the first day — the first event for the athletics team. She also competed in the 100m sprint. 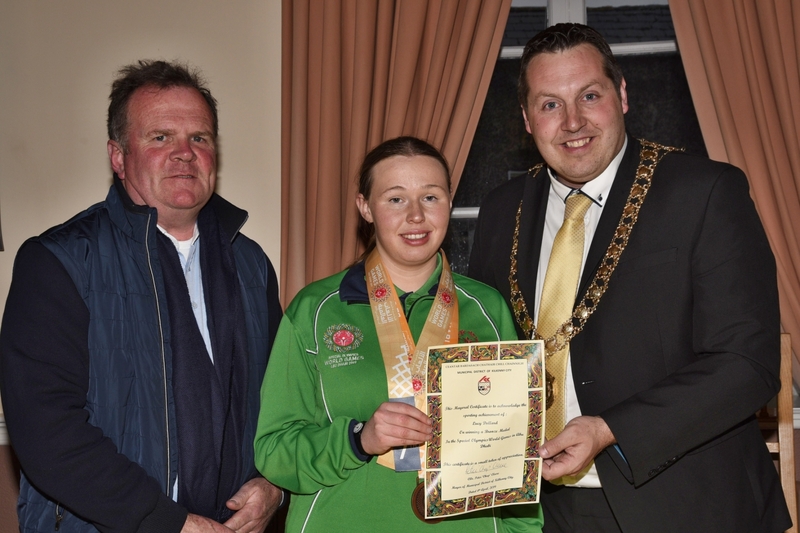 Mayor of Kilkenny Peter ‘Chap’ Cleere said he was delighted to be able to honour the young athlete with a mayoral reception. “We want to congratulate and thank Lucy for her contribution to sporting life,” he said. Among her friends, family and supporters were Lucy’s friends from L’Arche, Kingsriver, and Special Olympics Ireland. Also in attendance was Lucy’s grandmother Maureen Byrne (76), from Callan, who famously completed a zipline challenge to help raise funds for the Special Olympics. Lucy began swimming with the Kilkenny Special Olympics club eight years ago, where she also took up athletics and kayaking. This was her first time representing Ireland in athletics at the World Games. She received the good news that she had been chosen for Team Ireland last July. It involved months of training with her coach Brenda Whitely at the Watershed, as well as monthly training camps in Dublin.